There are three very, very similar Syrphus species that are common in the UK. S.vitripennis, S.ribesii and S.torvus. 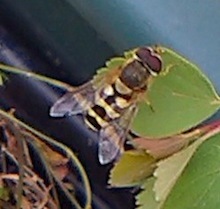 The picture below is most likely one of these three species, and, as it was the samllest observed may well be Syrphus vitripenis.